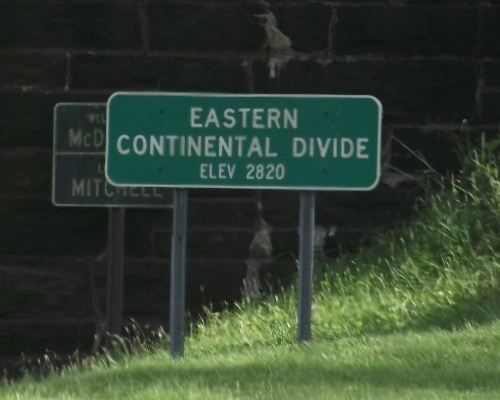 I saw this sign about the Eastern Continental Divide as we entered Mitchell County, NC. At an elevation of 2,820 feet it's just over half a mile high. I've heard this term for much of my life and have seen similar signs in other states. So, I finally decided to find out more about the Eastern Continental Divide. A watershed is essentially nature's bowl of water. 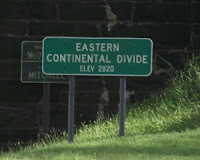 The Eastern Continental Divide runs from Pennsylvania to Florida. The rainfall runs downs the mountains and drains through streams and creeks until the water is collected by nature. The water ends up in rivers, lakes and eventually oceans. The Eastern Continental Divide demarcates the watersheds of the Gulf of Mexico and the Atlantic Seaboard Watershed. From this point, rainfall and runoff is divided between the Gulf of Mexico and the Atlantic Ocean. The EPA reports that there are over 2,000 watersheds in North America. Protecting a watershed from pollution, waste and debris is vital to protecting America's quality of water. Clean water is critical to the growth and development of all living things. We can all pitch in to help keep the watersheds as clean and free flowing as possible by practicing 5 ways to protect watersheds.